Hi, welcome. I’m Beth Meltzer with Epic Families. 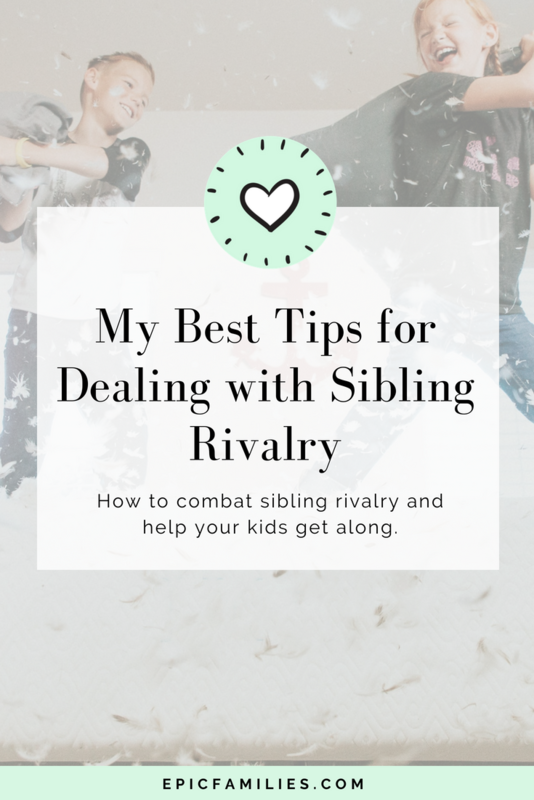 Today I wanted to take just a minute and talk to you about something that I get asked about quite a bit and that is the topic of sibling rivalry. You know, I think that we’ve all experienced it both as kids and most certainly as parents. In general, when there is sibling rivalry, our kids are competing for our attention, so one of the best things we can do is to make sure that we give our kids some individual attention on a regular basis. Now, that doesn’t have to include anything that costs a lot of money – it can be something as simple as a bedtime story to that child alone, special prayer time or just talk time, mom and daughter time, mom and son time or a walk around the pond or a shopping trip or a trip to McDonald’s or someplace. Just something special that is scheduled with each individual child. And if you do have a spouse or partner, it’s important that they spend time with the partner as well so that they all know that they are loved and valued within your household by both of you. Now another thing is what to do when you go out and you’re shopping and they start this. Well, my biggest solution for that is to beforehand, just come up with a list of tasks that they can help you with in the store and give each child. Now, I grew up with four, so give each child I would make out for little lists and give each child their own list of one or two things for them to purchase in the store, so they had a job to do at the store. They had an important job to do at the store. If you are a mom with a newborn, that can get a little bit tricky. I know, but the option’s there that I’ve found that work the best are either spending some time with a child during nap time or just developing really good bicep muscles and carting the baby around while you’re spending time with the other child. You can make up a schedule in advance so each child knows you can have them write it out, colored a different color for each child so they know what day is their special time and another really important thing to do is every night at bedtime make sure that every child is kissed goodnight and just told that they are valued and that they are loved. Now and along with this though, please don’t forget to spend time giving yourself time outs and spending time paying attention to yourself because it is very true that when mom is happy and mom is feeling better, the whole ship runs a whole lot more smoothly. Now, if you’ve tried just about everything to get your kids to listen and behave and to not fight and you don’t want to yell at them anymore, but you just haven’t found anything that worked, I might be able to help. I do offer an Epic Mom Mentorship, and I’ve helped dozens and dozens of women over the past 15 years go from a place of yelling, frustration and overwhelm to a place of calm and peaceful parenting. I will put that link below and I thank you so much for listening and I hope you have a wonderful day. Bye now.